For sale: The Boombox bus! Forget Bluetooth. Forget CDs. This is the ultimate in motoring audio. This is the ultimate in motoring audio. 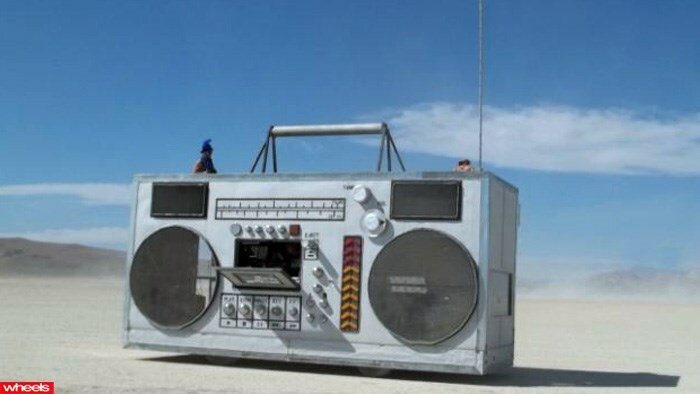 It’s called ‘The Rockbox’ and right now, this custom-built, 125 decibel ghetto blaster on wheels is up for sale. Click through the gallery for video of The Rockbox in action. A regular at music festivals in America, the twenty-four foot long bus was built in 2007 by 36-year-old music lover Derek Wunder in California. But with a baby on the way, Wunder says it’s time to sell his beloved creation. 'My bus creates a party literally every time you park it and music is playing,” Wunder is quoted as saying in UK paper the Daily Mail. Capable of holding up to 50 people, the portable party bus boasts inbuilt DJ decks, its own on-board 10kW generator and rotating LED lighting. It’s also got a massive 318 V8 engine, although sadly, it’s not road legal.